Hey are you ok? With growing cases of depression in India, what can we do? The very next day, I got a call from him. A senior manager in a very reputed company was crying like a little helpless baby. I was shocked. The ever increasing pressure in the office, stressful start up culture, more work but same paycheck, no time for himself. There were so many reasons that had put him on border line depression. After consoling and speaking to him for more than an hour, he was a little relaxed. As extra precaution, I asked him to go to a therapist as well. Now there are so many people who will go like, this is very common, lifestyle stress is a part of the routine, nothing unusual in it etc etc. But I think that’s where we go wrong. On one side, we don’t waste a minute to take a painkiller tablet even for smallest of a headache but emotional instability? No one gives importance to it. ‘Have you gone mental? why are you going to a therapist?’ Even today you will find people with such mentality! Even social media today is partially responsible for emotional stress. There are people who like to showcase how they are always happy, successful and no problem ever touches them, this kind of false projection is very harmful for the society. People get full of negativity because of unnecessary jealousy and inferiority complex. We always tend to think, our life is so uninspiring as compared to others and that’s very unhealthy for our generation. But at the same time, some people are using social media in a most brilliant way to speak about depression, emotional instability. 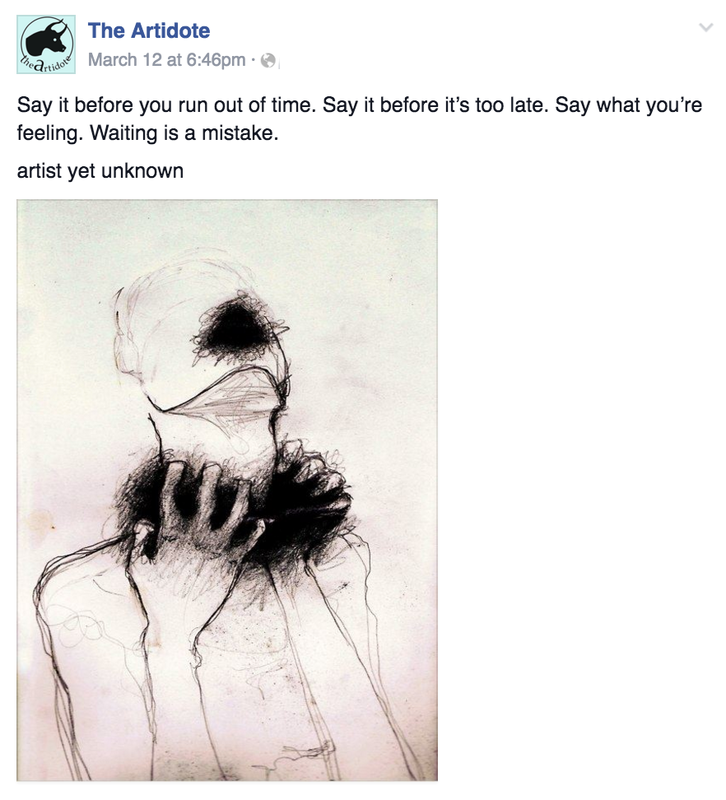 Most of you would know about the ‘Artidote community’ right? ‘Jova’, a very young and compassionate young person started such a strong community on Instagram that people are in awe! People who haven’t checked it, please check it out once. Do you know that almost every third person talking in the community is an Indian. That means India is going through a serious phase of depressed generation. Why so depressed? why are people talking in an unknown community but not with their family, friends and closed circle? Do they not have it? Are we unable to give a strong emotional support to our society? our people? our children, our senior citizens? This community functions at a global level with so much positivity and constant support that I am literally in love with it! ‘Please, I don’t understand depression, you have all the facilities available, food is always on the table, whatever you need, people are making sure to get it for you, then why are you depressed?’ I am sure in every family, school, college, office, you will find at least one person saying this thing with pride. Sorry to say, but I personally feel very bad for such people. There can be others with different ambitions, dreams and expectations and we don’t always need to understand them but just acknowledge their existence and support them, how hard is it to understand? A friend of mine who is a professional traveller just took a treatment for depression. One day, I couldn’t control myself and I asked her, ‘ Hey, what’s bothering you? You are a professional traveller, you are literally living our dream life!, ‘Grass is greener on the other side darling, it’s not easy to be on a go constantly, I feel lonely sometimes, I feel I need a partner with whom I can share my experiences.’ she quickly replied. I was very confused after hearing her side. I had never thought from this point of view. Depression can be very harmful and dangerous. It doesn’t show any significant signs and kills a person from within. Reasons for depression can be very different. from breakups to no growth in the job, from not having good relations with family to not being able to express in front of people. And a major misconception, depression is not showing only sadness or laziness. It can be fear, lack of self-confidence, not able to control the anger, disinterest. There are many subtle signs to understand and identify a depressed person, of course, only if you are willing to see. There are people who can manage themselves in a very good way, they have a strong supportive friend circle, their family is very cool, but not necessary, rest of people got the same thing right? So what can we do? first of all, let’s look at people from individual lenses, not through what we think or see. Everyone comes from a different background, different culture, different mindset and different set of problems. Everyone is fighting their own battle, so let’s be compassionate, let’s be patient. It’s our responsibility to take care of our loved ones. And like this ad suggests, let’s ask twice! Let’s not stop at once! Let’s be their strong support before they hit depression or start feeling lonely. Please let us know what do you think? Also giving a link of the Artidote community. Please have a look! *I don’t work for the Artidote community (in fact, if I get a chance I would definitely like to work for it) but have mentioned it since it’s very relevant to the topic.